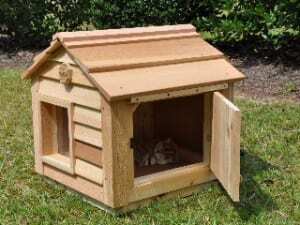 Blythe Wood Works has designed the Dog House Clean Out Door / Whelping Door. With over 25 years in the pet business, we have listened to our customers and now offer a access door. The Dog House Clean Out Door / Whelping Door allows the ability to clean out debris and check on the welfare of you dog and puppies, without having to unscrew panels or remove roof sections. 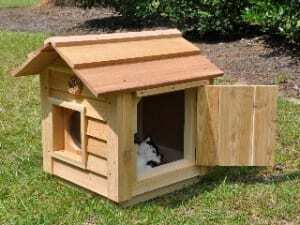 Blythe Wood Works has designed the "Peek-a-boo" Cat House Clean Out door to allow the ability to clean out debris and check on the welfare of your cats, without having to unscrew panels or remove roof sections. 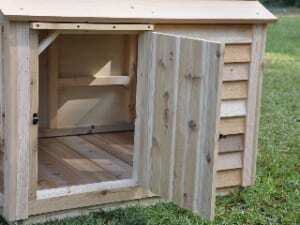 ** If you are considering The Hound Heater by Akoma Dog Products PLEASE NOTE: Due to the size of the entry / escape doors on the Cool Cat Cottage and the location of heater unit inside the house, Blythe Wood Works recommends only using the unit with the "Peek-a-boo" Clean Out Door. The "Peek-a-boo" Clean Out Door allows you access to the controls on the unit, without having to disassemble the roof panels and running the risk of damage to the house.